Project Description: An expansive installation including 68 Rubberway Treewells and sections sidewalks, pathways, and bus stops using the Rubberway EVOLUTION system. This three phase installation project will include a total of 68 Rubberway Treewells as well as rubber pathways, rubber walkways, and rubber sidewalks along bus stops. The first phase of the project has been completed and consists of 10 Rubberway Treewells located on Independence Avenue in front of the newly renovated Arts and Industries museum. These large tree wells were designed to remove trip hazards for pedestrians getting off buses to visit the museums which receive 27 million visitors per year. 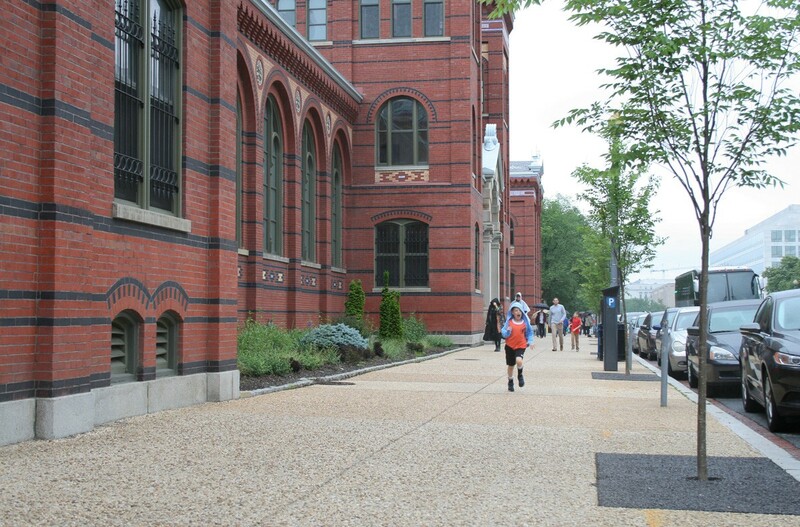 Additional Rubberway Treewells to be installed will span twelve city blocks on Independence Avenue as well as four blocks around the National Portrait Gallery. The new Rubberway EVOLUTION system was selected for the next phase of the project and was custom designed to match the surrounding stone sidewalks.